Jim Langabeer and Miles Tremlett’s musical collaboration dates back to 1978 in Tauranga where they were founding members of the Superba Saxophone Quartet. This group gave a standout performance at a Music Industry conference in Auckland in 1980, and was the resident quartet at the 1986 First National Summer Saxophone School. 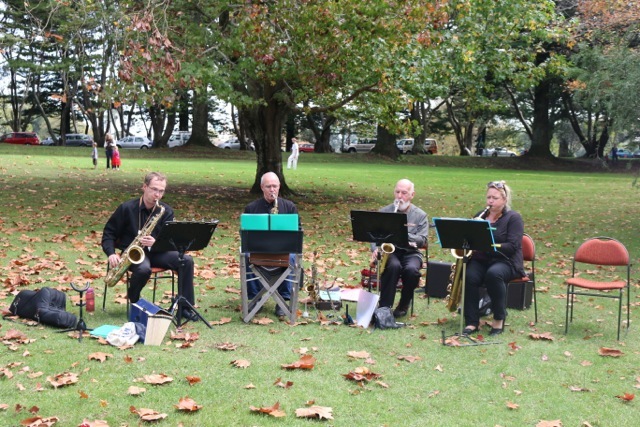 The Auckland Saxophone Quartet came into prominence playing several concerts in the early 1990s, with saxophone players Arthur Cameron, soprano; John Williams, alto; Murray Musson, tenor; and Adrian Wadsworth, baritone. Jim Langabeer joined the group in the late 1990s and plays soprano and alto sax, and continues the tradition with the current members: Nicola Haddock, baritone sax, Markus Fritsch, tenor sax, and Miles Tremlett, alto sax, who bring a wealth of musicianship and saxophone playing with them. All four musicians are both experienced players and qualified music teachers. Over the last several years, the group has played many concerts and other functions, and has a vast repertoire of styles and moods ranging through classical and jazz, popular and concert music. This programme will feature several of the group’s favourites by Handel, J.S and J.C Bach, plus some new arrangements by composers as varied as Mozart, Lennon and McCartney, and Leonard Cohen. There are popular New Zealand works by Eric Biddington, along with Rush Hour by Markus Fritsch. Also, Astor Piazzolla’s Libertango and some of the earliest saxophone quartets ever recorded, including Washington Post March from 1889 and Bull Frog Blues from 1916 along with the classic New Orleans favourite St Louis Blues, and a nod to Glenn Miller. Jazz standards also feature, such as Waltz of the Sax by Lennie Niehaus and Thelonius Monk’s Blue Monk, the 29th Street Saxophone Quartet’s Need to Know, Oliver Nelson’s Stolen Moments, and a beautiful Prelude by George Gershwin.